Lesbos is the third largest island in Greece. It has a total area of 1,632.8 square kilometres, is situated to the north of the island of Chios and belongs to the North-eastern Aegean Islands. Lesbos owes its title of “Queen of the Aegean” to the island’s outstanding natural beauty and there are also a number of particularly interesting sights. Also worth mentioning is Lesbos’ considerable significance in Greek literature, not only in antiquity but also in modern times. Many ancient myths are connected to Lesbos. Famous writers lived on the island both in ancient and recent times and often praised the island’s beauty in their writings. Nowadays it is fair to say that the island is suitable for holiday-makers who want to have a quiet and relaxing time in Greece. Lesbos offers a holiday away from noisy nightlife and is not swamped with wild and fun-loving tourists in the summer. The island of Lesbos has the shape of a sycamore leaf, with a large and sheltered bay in the centre. Its vegetation consists mainly of olive groves and pine forests. They give the eastern part of Lesbos its silvery-green shade, while the western part is rather bare and rugged. Mineral springs here and there and numerous beautiful natural beaches, perfectly shaped and with crystal clear water, delight the visitor and harmoniously blend into the beautiful scenery of the island. The capital of Lesbos is called Mytilini and has given the island its second name that is used alongside ‘Lesbos’. The capital is built like an amphitheatre around the southern harbour. It offers unique sights such as churches built in a particularly interesting style, the ancient theatre, the Roman aqueduct, a bronze copy of the Statue of Liberty in New York as well as many museums. Other sights worth visiting are the castle of Mytilini, the arts museum (pinacotheca) and the museum dedicated to the famous Greek folk painter Theofilos. There are also cosy taverns and restaurants that the visitor can discover and spend sociable evenings in and where the service is friendly too. Accommodation on Lesbos is clean and well-presented. Eftalou is situated on the north coast of the island of Lesbos in the Eastern Aegean, directly across from the Turkish coast. Eftalou is more of a holiday village than a village, as it consists mainly of hotels and taverns. There is also a thermal spring in Eftalou, to be found in an old bath house from the Ottoman era. It does have some newly installed swimming pools as well, where holiday-makers can relax in the pleasantly warm water. The water comes straight from the hot springs on the beach of Eftalou and works wonders for aching joints and muscles. After the hot springs cooling down in the sea is lovely. Behind the thermal spring lies the pebble beach of Eftalou. It consists of seven consecutive bays and tends to be very quiet. Unlike most other beaches on Lesbos, this beach is not managed, so you’ll have to bring your own deckchairs and sunshades. There is a regular bus service that connects several beach resorts in the north of Lesbos and stops in Eftalou. At the bus terminal there is a very good tavern, called “Eftalou” like the resort, where excellent food is served at a reasonable price. Tables and chairs are set out by the sea, and the view across the Eastern Aegean is simply stunning. The small town of Evriaki is located by the gulf of Gera on the island of Lesbos. There is only one managed sandy beach with a few taverns, restaurants and guesthouses as well as holiday villas owned by the locals. A holiday in Evriaki is for those who want to relax in a quiet place with beautiful scenery and who are not too bothered about culture and sight-seeing. Instead, holiday-makers can experience traditional Greek hospitality. Most of the locals in Evriaki speak Greek only, though, which can make communicating with them awkward, unless you know a bit of Greek. Even if it is only a few words, it is worth the effort and makes a big difference. Kalloni lies about three kilometres inland from the Gulf of Gera on the island of Lesbos. 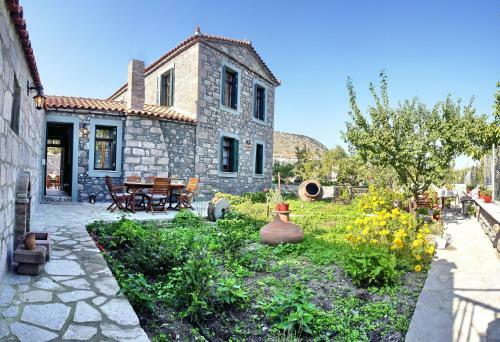 Situated on the biggest plain of the otherwise mountainous island, Kalloni is surrounded by fields and its inhabitants live on agriculture. The town has one local culinary specialty that is not to be missed: it consists of fresh sardines and is served as a starter in all restaurants of the town, preferably accompanied by an ouzo from Plomari. In the south-west of Kalloni salt-works produce salt in the traditional way by evaporating sea-water and storing it in big white mounds that can be spotted all around the bay. A variety of exotic birds live near the salt-works and can be watched from a bird observatory. The beach of Kalloni lies sheltered from the elements on the Gulf of Gera, and is perfect for families with small children. This sleepy little town on the island of Lesbos in the Northern Aegean has kept its medieval name of Molyvos – even though its official name since 1919 is Mithymna. The town is only five kilometres from the Turkish mainland and was built on a mountain slope. On the top of the mountain there is a castle, and holiday-makers are well-advised to leave their hire car at the bottom and walk up small, winding lanes with lots of steps to get to the castle. The town centre has a variety of colourful shops, cafes and taverns that give Molyvos an almost medieval appearance. The Turkish era has left its traces in the shape of typically Turkish architecture. The fishing harbour is to be found in the western part of the town. Next to it lies a beautiful, long beach with various water-sport options, e.g. kite surfing or scuba diving. In the vicinity of Molyvos is a natural hot spring. The town has not lost its natural charm, although an increasing number of modern hotels and apartment complexes are being built on the outskirts now. Mytilene was founded in the 11th century BC and is the capital and port of the island of Lesbos and the administrative centre of the Northern Aegean region. One of the most famous citizens of Mytilene was the poetess Sappho. Her poetry describes love and passion for both men and women, and the term “Lesbian” was coined in reference to Sappho in the 19th century. The historic harbour is well-preserved and one of the most interesting sites on Lesbos. For those interested in ancient and medieval history, Mytilene is a treasure trove. There are various mosques, and not to be missed is a visit to the archaeological museum and the Museum of Byzantine Art. Petra is the Greek word for “rock”, and a gigantic rock, 40 metres tall, is the first thing greeting visitors to Petra. The rock is crowned by a church dedicated to the Panagia Glykofiloussa, and it looks like it is watching over the town from its lofty height. After sunset, the church is illuminated and can be seen from a great distance. Those who are fit enough to climb more than 100 steps leading up to the top of the rock, are rewarded by a breath-taking view of the town of Petra, the island of Lesbos and the glittering waters of the intensely blue Eastern Aegean. The interior of the church is interesting too, with a lot of icons and some well-preserved frescoes. Petra is situated on a small bay with crystal clear water. There are a number of attractive leisure options for holiday-makers, e.g. trips on a glass bottom boat, scuba diving lessons, snorkelling, swimming, or just relaxing and sunbathing on the long sandy beach. Petra has many small hotels and guesthouses, as well as restaurants and taverns where excellent Greek food is served. It is the perfect holiday resort for people of all ages. Plomari, situated in the south of the Eastern Aegean Island of Lesbos, is the second largest town and the Ouzo Capital of the island. This is where the famous Ouzo Plomari is made, with aniseed from Lisvori in the north-east of Lesbos and water from the river Sedountas, following the same recipe that Isidoros Arvanitis used in 1894 to produce the first Plomari Ouzo. There still are many active Ouzo distilleries in Plomari, and its lovely, spicy aroma wafts over the entire town. The distillery of the Barbajanni Company has set up an Ouzo Museum, where old distilling equipment can be admired. The town of Plomari is located on either side of a dramatic gorge of the river Sedountas. It has picturesque little lanes, and a walk around town leads past old tanneries, manor houses that dream of former splendour, and dilapidated soap factories. The bustling main square is surrounded by cafes, taverns and small craft shops. The Agios Isidoros Beach just outside Plomari is rated as one of the best and cleanest beaches on Lesbos and has been awarded the blue flag for clean beaches with outstanding water quality for several years now. The sandy beach of Skala Eressou lies in the barren west of the island of Lesbos. The dirt track leading there is no indication of the beautiful beach you find at the end of it. Skala Eressou is one of the most attractive beaches on Lesbos and has been regularly awarded the blue flag for exceptionally clean beaches. Sheltered from the Aegean winds due to its protected location in a bay, the sea at Skala Eressou is often as smooth as a mirror. Deckchairs and sunshades can be hired on the beach, and there are cafes, bars and taverns in the vicinity, where holiday-makers can have a delicious Greek meal with a beautiful sea-view. The sea is just right for a variety of water sports, swimming, snorkelling and diving. This is the perfect place for a perfect holiday. Accommodation options for various budgets are offered by local hotels and guesthouses. In recent years Skala Eressou has become an international venue for lesbian women. Once a year in September the Sappho’s Pride – International Women’s Festival takes place in Skala Eressou. The beautiful resort of Vatera is situated in one of the most unspoilt and idyllic regions of Lesbos. It is the perfect place for a relaxing holiday and has the longest beach on the whole island – 8 kilometres of sandy beach. Gently sloping into the shallow water, it is ideal for families with small children. There are water sport options available like sailing, diving and snorkelling, and the beach has been repeatedly awarded the blue flag. Accommodation options include family hotels and apartment complexes.